There are a few ways to respond to Bowser’s latest attempt to rule the Mushroom Kingdom, which finds Mario and friends tossed out of the castle and once again squaring off against the Koopalings that block the way home. Veteran Wii owners will still find themselves able to turn the Wii-Mote sideways, with up to four players filling the shoes of Mario, Luigi, and two different colored Toads. The new invitation for solitary play is made via the Wii U’s gamepad, which allows players to use it as a controller while looking at their television, or ignore the TV and focus entirely on the screen of the gamepad. I wasn’t long for turning off the television and doing just that, walking around the second floor of my house while the game ran on the console one floor below. Possibly aided by thin walls, the range was impressive – the game would freeze if I began wandering beyond its range, and return to life as soon as I took a few steps back. Aside from taking a walk to the kitchen to refuel, the bonus here would be for those sharing a television, now able to snap headphones to the gamepad and allow someone else to watch TV while playing uninterrupted. It’s definitely worth mentioning that playing on the gamepad is like gaming on the most comfortable handheld device I’ve ever clutched in my hands. Excessive 3DS or Vita time often causes my digits to ache, and the Wii U’s gamepad is like a big comfy couch in comparison, keeping my hands at an ideal distance from one another while providing grips that allow them to hit every button with little effort. 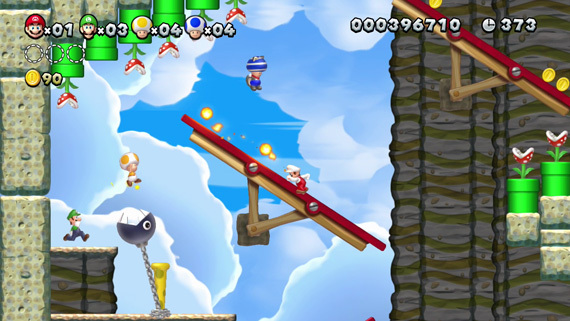 The gamepad also enhances the jerk factor of the original New Super Mario Bros. Wii. 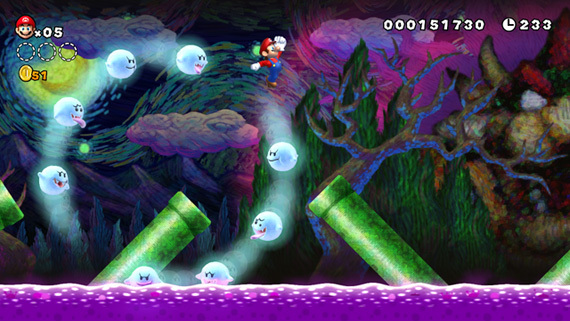 The game itself continues to provide a chaotic space where friends and family curse one another while falling into lava pits and being robbed of power-ups. And now a fifth player can enter that arena with the gamepad, creating blocks by simply touching the screen of the pad. The ability instantly offers the chance to aid and/or hinder other players, creating blocks to knock them down or to assist them in going further. While I haven’t been able to help being a jerk with the feature, the ability to assist one or more players through levels is a critical achievement for Nintendo. 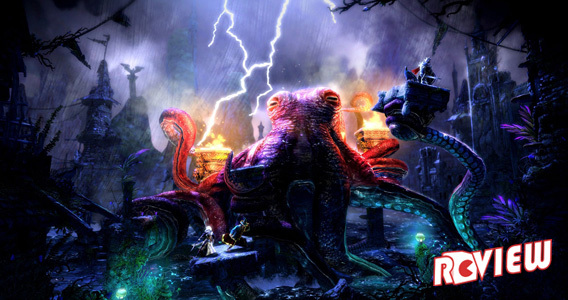 The publisher has long been focused on finding the means to offer assistance to players, with special abilities or guides when players fail a level too often. And while the game will still offer guides in this regard, the ability of another person to create aids within these stages gives players the opportunity to help each other rather than resorting to built-in cheats. It’s an important option for co-operation, and additionally, provides the chance for seasoned players to also make use of the feature by assisting one another in speed runs – I find it continually fascinating to experiment with how far someone can aid my game without us speaking about it, simply taking Mario for a run and having them anticipate my movements. The greater significance is a resistance to gimmicky features with the gamepad, which is herein put to use strengthening the appeal of the original release, either by adding to the chaos, or giving players a fresh means of aiding each other. It may prove a more subtle use for the new hardware, but offers more long term gain than the myriad of ridiculous actions the availability of a touchscreen might have otherwise encouraged. It’s possible that playing on the gamepad made every little detail of the world map stand out greater for the trouble. The key to the map is that while it still stands to offer a road connecting the stages, it feels less like a utilitarian grid than any 2D Mario game in recent years. The road expands to eventually offer an alternative that could find you skipping a zone altogether, and individual zones present options toward each castle in much the same way. 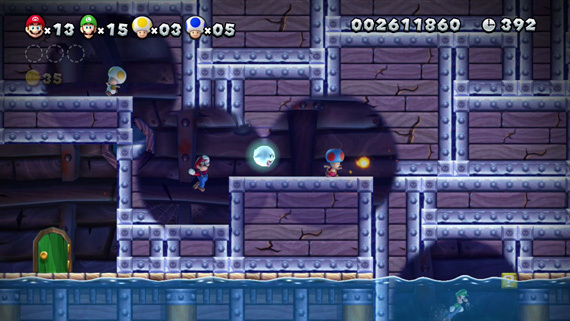 Rushing toward the end of the game will leave plenty of stages to revisit around the main path players cut – helpful pipes allow Mario to quickly fire himself into each zone to make a quicker business of backtracking to hit skipped stages and tackle secrets that open after conquering the story mode. The world map has a beat all its own, one giant open and connected space with small actions that present games outside of stages. Trees sway and the flags of conquered castles blow on the wind while airships hover in the distance to offer signs of life, but the pulse runs deeper than these initial sights. A multiple path in one zone might task Mario with choosing the route while enemies wait to ambush him at points on the grid – engaging a sudden challenge area where Mario will have to defeat a group of enemies before returning to the map. There’s also Nabbit, a character that will pop up on the map and then hide within a stage, wherein Mario can enter the stage and attempt to grab him in order to receive some stolen booty. 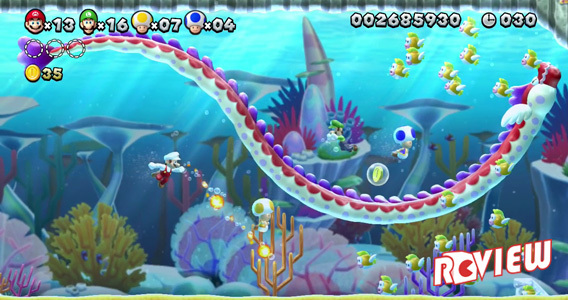 Occasionally, I even ran into a baby Yoshi on the map, which would then follow me into new stages and allow me to use it to gobble up enemies and make use of specific baby Yoshi powers – blue Yoshi spits bubbles, yellow Yoshi provides light, pink Yoshi will balloon out to provide a lift and parachute during falls. The life of the world map does more than simply nod nostalgically back to Super Mario World. It can seem like such a small consideration, but the effort here goes miles toward creating a living world, versus a collection of Mario challenges, as seen in games like Super Mario 3D Land. Even silly little diversions like hitting switches on the world map to expand pathways toward new stages lends a sense of lived-in spaces. 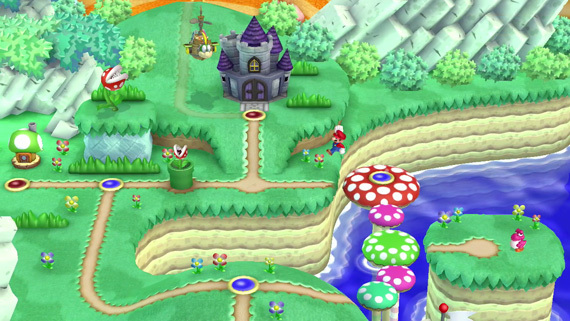 Each area presents at least one midpoint stronghold, where a large Koopa will be waiting at the end of a castle for his requisite three stomps on the head. This is usually a generic space for mid boss encounters, but the game continues adding small changes to the scale and attack of your opponent. More attention is warranted by the final boss castles for each zone, which offer some crushing challenges for Mario, who must reach the top in order to launch himself onto the airship of each Koopaling for a final confrontation. While the formula is familiar, again, it constantly searches for small ways to differentiate each encounter – with the height of the cleverness likely being fighting Bowser Jr. underwater and getting Mario seeking torpedoes to strike his submarine. And before I forget, as with New Super Mario Bros. 2 on the 3DS this year, Ghost Houses again provide maze-like challenges that require checking every door twice, and perhaps pulling a few hairs out while trying to discover the correct and often hidden exits. The newest power-up in Mario’s arsenal is the squirrel suit, which allows Mario to glide on the air and cling to the side of bricks, which saved my skin more than a few times. 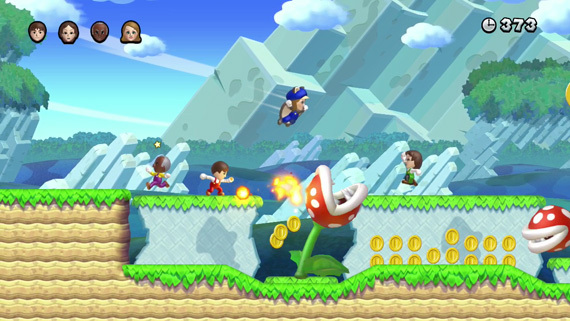 Standard power-ups see the fire and frozen flowers return along with invincibility. Fully grown Yoshi also makes a return in some stages, allowing Mario to once again hop on his back and eat enemies, as well as apples that Yoshi processes into power-ups via means likely best left unconsidered. 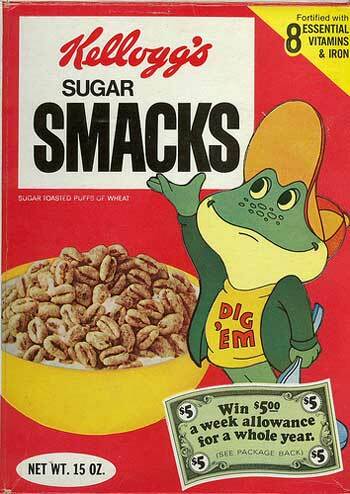 A green Yoshi will leave players at the end of a stage however, which is really the one nagging limitation here. Nintendo is throwing just about everything on top of the kitchen sink into the offering, but I’m still left wanting for that sense of breaking the rules – of traveling back on the map to get a Yoshi in order to bring it into some stage it may not have been meant to exist within. Bowser’s familiar list of minions receives some variations along the road as well, with enemies occasionally changing well-worn attack strategies – Piranha Plants may spit ice instead of fire or sprout legs, and Goomba’s may hide in rocks to be awaken by fire. Some stages might suddenly make these enemies gigantic, which causes them to split into smaller versions when stomped. Along with a few new oddities, the game is consistently searching for the means to beat the expectations of Mario veterans. The smallest detail that deserves far more words award goes to the background stage art, perhaps most notably for a section of the Soda Jungle that taps inspiration from Vincent van Gogh’s Starry Night. 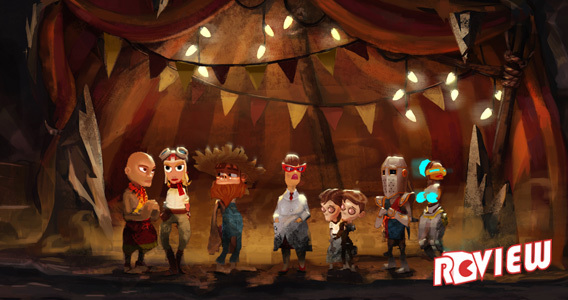 A great many stages express more effort at providing backdrops that often express a near painted texture, again showing a level of detail long absent from the background concerns of the formula. It isn’t quite the 16-bit reproduction the comparisons to Super Mario World might leave you imagining, but more a modern bit of artistic bent that definitely draws comparisons all the same. I’ll suggest that while it could miss the player’s attention for all the concerns of the foreground, the background art of several stages serves as the most significant artistic achievement on hand. In addition to using the gamepad to bolster the multiplayer appeal, Nintendo has also brought a tighter sense of spatial awareness to Mario’s latest outing. While the game still provides space for multiple players, solitary sessions don’t suffer the same loss of intimacy that the original Wii release did. 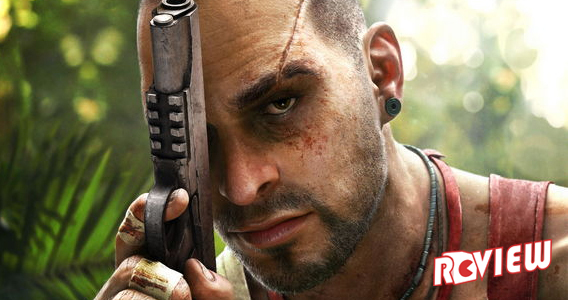 It’s again likely that playing on the gamepad fed that intimacy as well – it never felt like I was missing other players while tackling the game on my own at any rate. 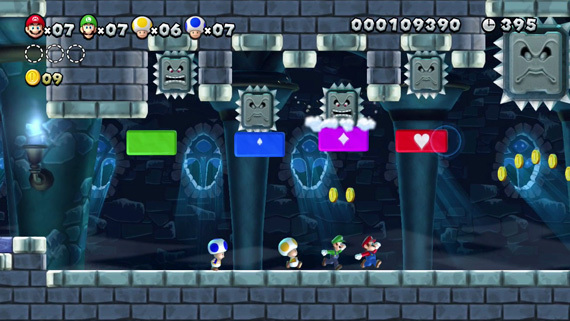 New Super Mario Bros. U also provides additional playmodes, allowing players to take on challenges using the proper cast of the game or their individual Mii creations. 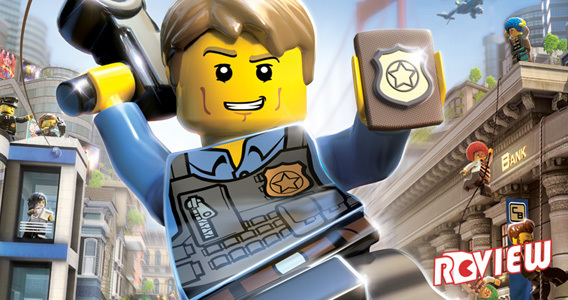 The game offers three modes, Challenge, Boost Rush, and Coin Battle. The Challenge Mode offers tasks based on coins, 1-ups, and specific objectives, such as stomping a series of enemies without hitting the ground. Anyone looking to redefine the idea of speed-runs should give Boost Rush a try, with the screen speed increasing with the more coins players collect. Nintendo’s old war horse resists the odds of saturation, not so much raising the bar for itself as putting it back where it should have been in recent years. 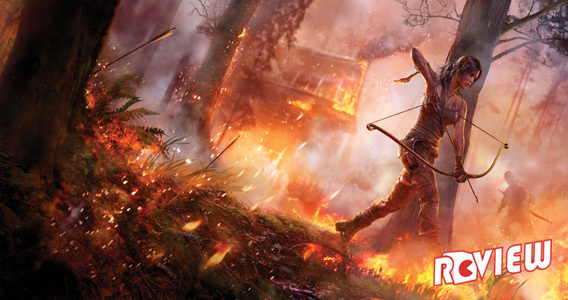 The familiar inspirations come from a wider history of the franchise, encouraging new aesthetic details that flourish within the typically clever stage designs – stages that claim as much space for frantic multiplayer sessions as they do for those looking to painstakingly search out more solitary secrets. 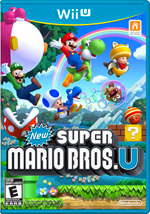 Across the expanse of the world map, the momentum of creativity sets the bar firmly in place for Mario and company, with an adventure that never falls asleep at the wheel or falls back into coasting simply on nostalgia – including a final confrontation that may prove one of the most elegant in the franchise’s 2D history. While familiarity and countless revisits may speak against the odds, New Super Mario Bros. U is one of the finest launch titles one could ask for.